In the next few weeks leading up to the season, each of the West Lot Warriors will be posting our predictions for the upcoming season. 2015 is the year of the ‘Cats. I see us outshining expectations and getting back to a bowl game. It may be the Popeye’s Chicken and Gravy Bowl, but hey, at least that’s in the Bahamas (I think). Overall, it’s years like these – when the chips are down for the program and expectations are low – where we seem to bounce back, win some close games and put together a good season. If there’s one thing good you have to say about this team over the past few years, it’s that we haven’t played a cupcake non-conference schedule (2013 could be an exception there). This year, the non-con slate is tougher than ever. We start off against a preseason ranked Stanford team looking to make a statement. I love the fact that Stanford is ranked coming into the year – that can only help us, and will give our young team a great test to start off the year, with really nothing to lose.Then we go down to Durham, NC in week three, to play a no-longer-laughable Duke team with a high octane offense. We take on Ball State in week four, which shouldn’t be a walk in the park either. It’s unrealistic to think we’re going to come close to running the table in those first four games – I’d say 2-2 is likely, and 3-1 would be wonderful. That leads us into the conference schedule, which doesn’t seem to be that bad this year, relatively speaking. It’s pretty crazy how much weaker our side of the conference is than the Big Ten East. The East has #1 ranked OSU, which should be an absolute monster, along with Michigan State, PSU and a Harbaugh-renewed Michigan. The Wolverines may still be getting their feet under them this season, but they will be a force to reckon with in the years to come. On our West side, the teams I’m worrying about are Wisconsin, Nebraska and Minnesota (who I could see having a really good year in 2015). Well, to be fair I’m worrying about all the games, since there will not be any gimmes this year. Ok, so up to this point I’ve spoken a lot about a lot of other teams, but not too much about the Cats. The headline there is that I don’t see many concrete reasons why our team will be better this year. Christian Jones will be back at WR, but he’s basically the only WR worth mentioning at this point. TBD QB can only throw to him and Vitale so many times before an opposing defense figures it out. Justin Jackson was hurt in the spring, and we’re going to need him healthy fast as he’ll need to carry a huge load this year. The kid was fantastic last year – he always seems to fall forward and always seems to find a way to grind out 4 yards even when there’s nothing there. We’re going to need to lean on him, some read option and play action to move the sticks. I don’t have much faith in our offense in 2015, since to do all those things you need a good offensive line, and frankly we don’t have that. The defense should be good. I was glad to see young players like Anthony “Cakes” Walker, Godwin and Xavier get some playing time last year. Our defense is young, hungry and loves to hawk the ball which is great. The problem is they’re going to need to keep the score in the teens or low 20s to give us a chance, since our offense will not put up points. The MO should be grind out each game, pound the rock, and try to limit possessions in order to keep games low scoring and close at the end. The beacon of hope for me is that our team’s luck is due to change. We’re due to begin winning some of these close games, which the Cardiac Cats have not done of late. We’re 6-11 in one-score games in the past three years. I think the Cardiac Cats get back to their ways and win some close ones this year. My prediction for this year is 6-6 – splitting the non conference games and then going 4-4 in the Big Ten. In the B1G, I’m predicting we’ll beat Purdue, Illinois, Penn State and Iowa on Homecoming – and I also do have a good feeling about our game against the Huskers this year but won’t jinx it by predicting a win. Our goal for 2015 should be to make a bowl game, and get our young team those extra reps and practices (and the game) that come along with it. We should be working to build up our QB, which is looking like Clayton Thorson at the moment. I’d love to get the kid a full year of experience, and allow him to begin to grow. If it works out with Thorson, he has an opportunity here to start for four straight years and continue to improve. 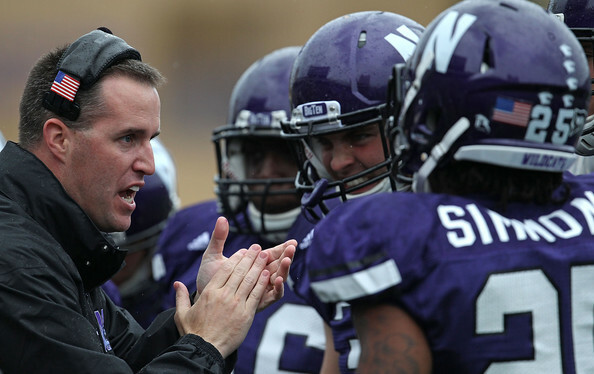 It’s Bowl or Bust in 2015 – if we don’t make a bowl this year, then it’s time to take a hard long look at Coach Fitzgerald. Usually I’m one of the more optimistic West Lot Warriors when I make my preseason predictions, but this year I’m going to take a different tack and see if I can’t reverse jinx our Cats. Player to watch: Christian Jones. He was our best wide receiver before he got hurt. We need him to be back at 100% and get open to give our inexperienced QB some easy looks and jump start the offense. Game to watch: Stanford. This is a bit obvious since it’s our first game and will help us gauge where our team is at. This is a good team, ranked in the low 20s or high teens in most preseason polls I’ve seen. No one is giving us a chance in this one, but I’m more optimistic here. This Cardinal team is built to dominate the line of scrimmage and grind out games, by playing great D but not necessarily putting up a boatload of points. I think if we can stall them in the red zone and limit them to FGs, we can hang with that type of team and at least keep it close. We’ll see. The Warriors will be going hard for this one. Warrior to Watch: Andy “Bay” Day (or A Bay Day for short). A new resident of San Francisco, how will he cope with the long distance from the West Lot in Evanston? How will he handle 9am PST start times after a Friday night out? Will he join a commune just to brainwash some Nor Cal residents into wearing purple and watching the ‘Cats? We’re all eager to find out.